You know that charming little cafe on New York’s Lower East Side that just closed after a mere six months in business—where coffee was served on silver trays with a glass of water and a little chocolate cookie? The one that, as you calmly and correctly observed, was doomed from its inception because it was too precious and too offbeat? The one you still kind of fell for, the way one falls for a tubercular maiden? Yeah, that one was mine. I never realized how ubiquitous the dream of opening a small coffeehouse was until I fell under its spell myself. Friends’ eyes misted over when my wife and I would excitedly recite our concept (“Vienna roast from Vienna! It’s lighter and sweeter than bitter Italian espresso—no need to drown it in milk!”). It seemed that just about every boho-professional couple had indulged in this fantasy at some point or another. The dream of running a small cafe has nothing to do with the excitement of entrepreneurship or the joys of being one’s own boss—none of us would ever consider opening a Laundromat or a stationery store, and even the most delusional can see that an independent bookshop is a bad idea these days. The small cafe connects to the fantasy of throwing a perpetual dinner party, and it cuts deeper—all the way to Barbie tea sets—than any other capitalist urge. 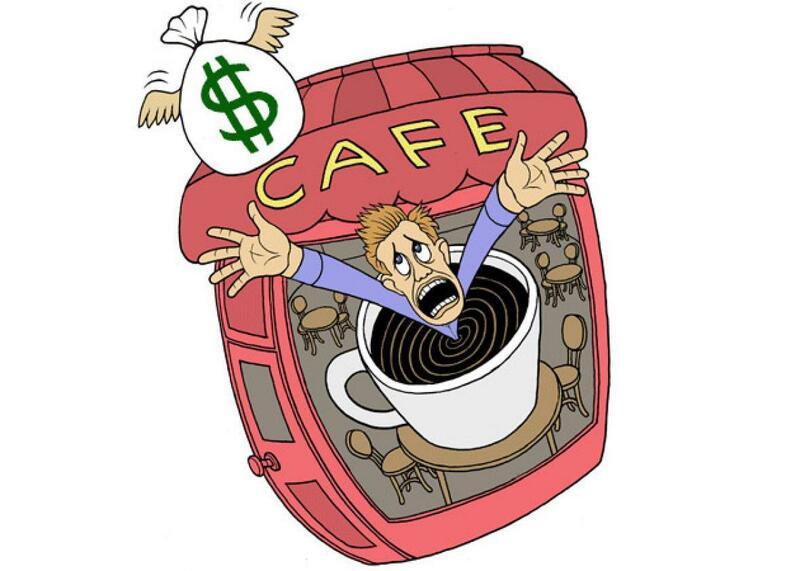 To a couple in the throes of the cafe dream, money is almost an afterthought. Which is good, because they’re going to lose a lot of it. A place that seats 25 will have to employ at least two people for every shift: someone to work the front and someone for the kitchen (assuming you find a guy who will both uncomplainingly wash dishes and reliably whip up pretty crepes; if you’ve found that guy, you’re already in better shape than most NYC restaurateurs. You’re also, most likely, already in trouble with immigration services). Budgeting $15 for the payroll for every hour your charming cafe is open (let’s say 10 hours a day) relieves you of $4,500 a month. That gives you another $4,500 a month for rent and $6,300 to stock up on product. It also means that to come up with the total needed $18K of revenue per month, you will need to sell that product at an average of a 300 percent markup. Pastries, for instance, are a monetary black hole unless you bake them yourself. We started out by engaging a pedigreed gentleman baker with Le Bernardin on his résumé. Hercule, as I’ll call him, embodied every French stereotype in existence: He was jovial, enthusiastic, rude, snooty, manic-depressive, brilliant, and utterly unreliable. His croissants were buttery, flaky, not too big, and $1.25 wholesale. We sold them for $2 and threw away roughly 50 percent—in other words, we were making a negative quarter on each croissant. After a couple of months of this, we downgraded to a more Americanized version of the croissant (vast and pillowy). The new croissants ran 90 cents each and made us feel vaguely dirty. We sold them for the same $2. Ironically, their elephantine size meant that every time someone ordered a croissant with cheese, we had to load it up with twice as much Gruyère. Coffee was a different story—thanks to the trail blazed by Starbucks, the world of coffee retail is now a rogue’s playground of jaw-dropping markups. An espresso that required about 18 cents worth of beans (and we used very good beans) was sold for $2.50 with nary an eyebrow raised on either side of the counter. A dab of milk froth or a splash of hot water transformed the drink into a macchiato or an Americano, respectively, and raised the price to $3. The house brew too cold to be sold for $1 a cup was chilled further and reborn at $2.50 a cup as iced coffee, a drink whose appeal I do not even pretend to grasp. But how much of it could we sell? Discarding food as a self-canceling expense at best, the coffee needed to account for all of our profit. We needed to sell roughly $500 of it a day. This kind of money is only achievable through solid foot traffic, but, of course, our cafe was too cozy and charming to pop in for a cup to go. The average coffee-to-stay customer nursed his mocha (i.e., his $5 ticket) for upward of 30 minutes. Don’t get me started on people with laptops. There was, of course, one way to make the cafe viable: It was written into the Golden Rule itself. My wife Lily and I could work there, full-time, save on the payroll, and gerrymander the rest of the budget to allow for lower sales. Guess what, dear dreamers? The psychological gap between working in a cafe because it’s fun and romantic and doing the exact same thing because you have to is enormous. Within weeks, Lily and I—previously ensconced in an enviably stress-free marriage—were at each other’s throats. I hesitate to say which was worse: working the same shift or alternating. Each option presented its own small tortures. Two highly educated professionals with artistic aspirations have just put themselves—or, as we saw it, each other—on $8-per-hour jobs slinging coffee. After four more months, we grew suspicious of each other’s motives, obsessively kept track of each other’s contributions to the cause (“You worked three days last week!”), and generally waltzed on the edge of divorce. The marriage appears to have been saved by a well-timed bankruptcy.